The Association for Business Communication-Southwestern U.S. has posthumously awarded Judi Biss, former Stephen F. Austin State University lecturer in the Rusche College of Business, the 2018 Outstanding Business Educator Award. NACOGDOCHES, Texas - The Association for Business Communication-Southwestern U.S. has posthumously awarded Judi Biss, former Stephen F. Austin State University lecturer in the Rusche College of Business, the 2018 Outstanding Business Educator Award. Biss began teaching at SFA in 1999 and continued serving for almost 20 years. 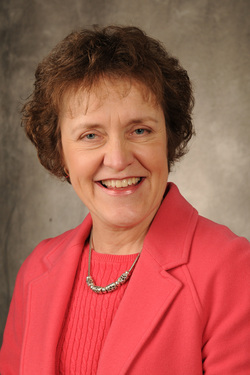 She taught various business communication courses and was an advocate for undergraduate and graduate research. Biss passed away in June 2017, and her husband Luis will accept the award on her behalf at the March 2018 Federation of Business Disciplines Conference in Albuquerque, New Mexico. Dr. Marsha Bayless, professor and chair of the Department of Business Communication and Legal Studies, praised Biss for her dedication to SFA students and her service to the university. "Judi is an excellent recipient for this award because her first priority was her students. She made them feel welcome in class, took personal interest in their accomplishments and kept in touch when they moved on to other courses," Bayless said. "She also was an excellent advisor and worked to make students successful in their progress at SFA." The ABC is an international, interdisciplinary organization committed to advancing business communication, research, education and practice, according to the organization's website.